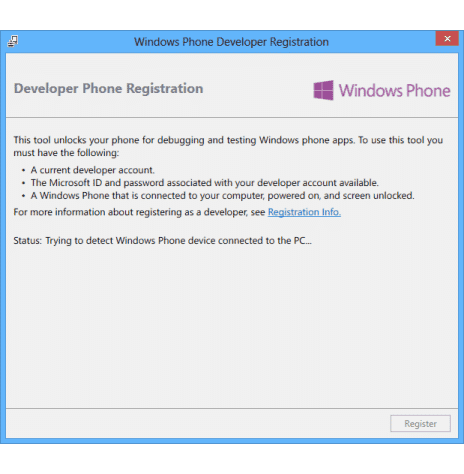 Unlock Developer locked windows phone 8 for free (tutorial). Note: we will post for publishing your apps for free using dreamspark student id. Before starting the tutorial,I would like to convey you that Unlocking your Windows Phone, will void your warranty but don’t worry you can get it back just by unregistering your device. 1. First of all go here to create a Microsoft Live ID if you already don’t have one. 2. Then go to appstudio to register yourself as a developer with the Live Id you have just created.You just need to sign in to register yourself. 3. Now you need to download the SDK 8.0 to unlock and create apps for Windows Phones. You need to have Windows installed in your PC to run the SDK , Windows 8 is recommended. *since the original SDK is of GBs and if you only want to developer unlock your Windows Phone not to create apps, you can download the mini SDK (about 60MB) ,just to developer unlock your Windows Phone. 4. Now install the SDK on your Windows 8 PC. After that you will get a shortcut for Windows Phone Developer Registration Tool on your desktop or Start Menu. *If a ‘connectivity.dll’ error shows up during installation then make sure you have .NET framework 4.5.1 installed, if not download here. 5. 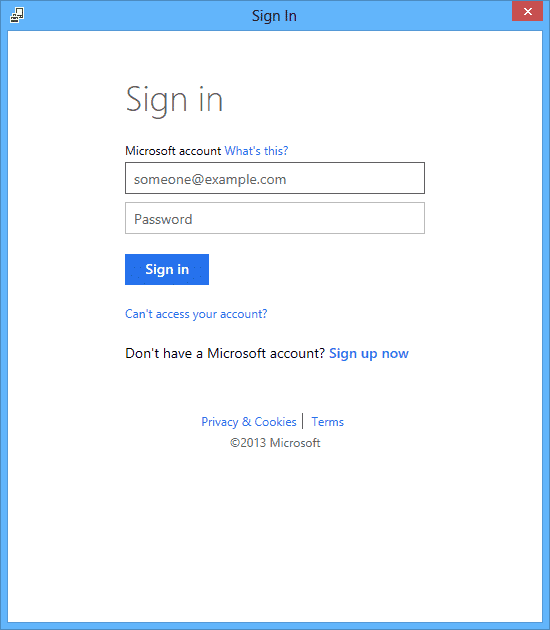 Run that application and connect your Windows Phone 8 device to PC,unlock the screen and enter the passcode of your Device. 6. Sign in using the Live ID and you will see a ‘Register’ option. Click on it to Register and Developer unlock your Device. [highlight]Congrats!!! You just Developer unlocked your Windows Phone 8. [/highlight] If you want to Unregister your device, simply open the Windows Phone Developer Registration Tool and click on ‘Unregister’. 7. You would require this small application to deploy your apps to your Windows Phone 8. Now you can opt to get latest updates for your Device from Microsoft. To get early updates, simply download this small utility app “Preview For Developers” from store, open the app and check “Enable Preview For Developers” and then tap done. Now you will get early updates for your Device. To Unregister your Device from getting early updates, simply uncheck the box and tap done. *Note: XAPs downloaded from windowsphone.com can’t be deployed to your device only your apps can be deployed,or,you can search and download required XAPs from windowsphonehub.in . 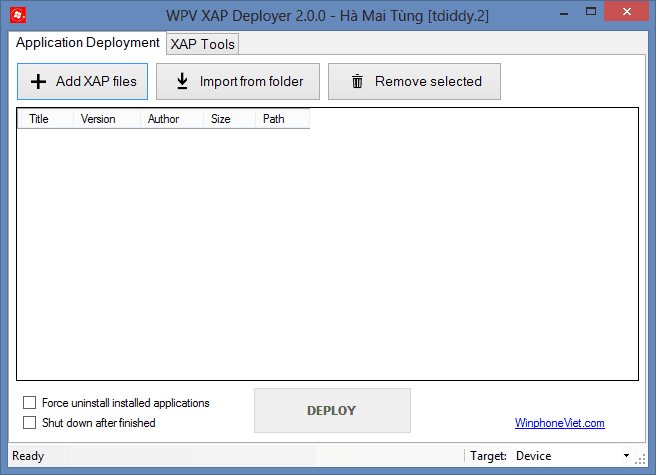 Open the WPV XAP Deployer.exe and select your XAPs. Check the ‘Target’ is set to ‘Device’. With great pleasure, hit ‘Deploy’. Wait a few seconds and you will get it installed on your Device. If you found any problem in unlocking your windows smartphones, please comment here and you can join our group for more info on Windows Phone here .